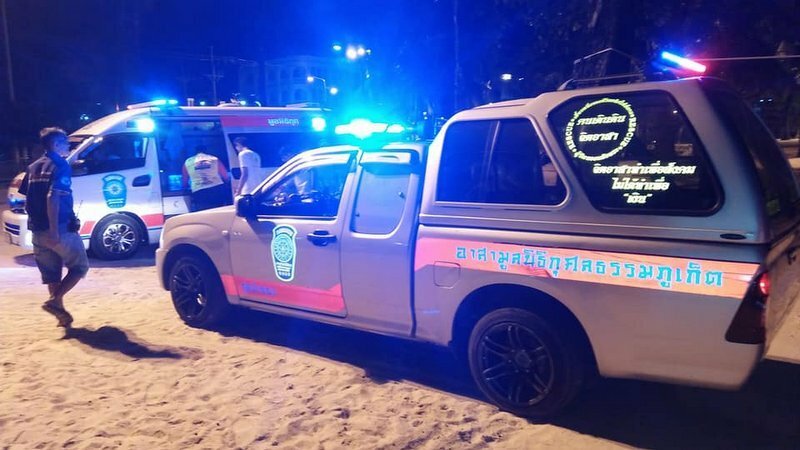 PHUKET: A 30-year-old Chinese tourist drowned at Patong Beach early Saturday morning (Mar 2) after ignoring warnings to not enter the water while drunk. Supat Tiangnoi, head of Patong Baywatch*, told The Phuket News this morning (Mar 4) that the incident happened while he and other Baywatch members were patrolling Patong Beach by ATV at about 4am. Mr Supat said he saw a group of about nine Chinese tourists drinking alcohol together on the beach in front of Loma Park. “The tourists were drunk, and I warned them that they should not play in the sea. I advised them that if they wanted to go into the water that they must not go any deeper than knee-level,” Mr Supat explained. Mr Supat added that after warning the group, he moved on to patrol other areas of the beach. At about 4:20am, some of the tourists came running up to him, calling for assistance, he said. “They said that four Chinese male friends had gone into the sea, and that some of them had came back, but one man had disappeared,” Mr Supat said. The missing man was later identified as Lu Meng Yang. “We rushed into the water and found Mr Lu after about 15 minutes. He was face down in water about 200 meters from the beach,” Mr Supat said. Mr Lu was brought ashore and emergency first aid was provided until rescue workers arrived and rushed him to Patong Hospital, but he was pronounced dead on arrival, Mr Supat explained. Lt Chanat Hongsitthichaikul of the Patong Police told The Phuket News this morning that the cause of death had been confirmed as drowning. "Chinese consular officials have been notified of the incident,” he said. “Mr Lu’s body remains at Patong Hospital awaiting his relatives to arrive from China,” he added. * The Patong Baywatch team is a group of seven people, including former lifeguards, who patrol Patong Beach for safety. The team was created and remains funded by the Patong Development Foundation, which was founded by local businessman Preechavude ‘Prab’ Keesin, a son of long-time former Patong Mayor Pian Keesin. Furthermore...at 4 AM, there couldn't have been many other swimmers on the beach. If Team BGaywatch recognized the potential danger, they should have stayed and watched the drunken fools, and should have intervened when they saw the Chinese being dumber than usual. Short and sweet...if they call themselves "LIFEguards"...they should be guarding lives. So Fasc...you re-read it, and don't go adding your own words like "if they were going to ignore him...". And nobody implied that Team Baywatch had to risk their lives. REAL lifeguards would have prevented this event and the ensuing tragedy. Team GBaywatch actually recognized the potential danger, but used poor judgement and failed to prevent a preventable tragedy. Crap judgement Ben- why should the (in your words)- wannabe lifeguard put his life in jeapordy for a bunch of drunks. Why don't YOU read the article-he stated that if they were going to ignore him they should only go in up to their knees. In my book 'paddling' does not equal' swimming'. Please don't start sentences with 'so', either, it's so Millenial. Read the story ...the wannabe lifeguard said “The tourists were drunk, and I warned them that they should not play in the sea. I advised them that if they wanted to go into the water that they must not go any deeper than knee-level,”. In short, Khun Baywatch told them they could go in the water...so they did...and one died as a result. Crap judgement by team Baywatch. At one point China was going to ban travel to Phuket. I guess they realized they could lift the one child policy instead, and  let Phuket control the population with added benefit of "Darwin Award" pinpoint gene culling. Crappy 400 characters! Only the Chinese and there defiance are to blame .Not for the first time.